Cézanne painted images of bathers throughout his career. French dealer Ambroise Vollard bought his first Cézanne paintings in 1894 and within two years commissioned the artist to make lithographs of the subject. These were sent to the Armory Show by Vollard, and proved to be very popular with collectors. 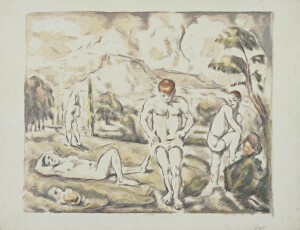 Seven prints of The Bathers, large plate and six prints of The Bathers, small plate sold at the Armory Show.